The FMC group explores a diverse range of topics with a variety of approaches, all surrounding dynamic behavior and automatic control of flight vehicles. This includes research that establish new theoretical results, defines new computational algorithms, performs unique analysis and experiments, and creates technology that changes engineering practice. Advancements from this research are applied to airplanes, rotorcraft, launch vehicles, satellites, space probes, missiles, projectiles, parachutes, parafoils, the air transportation system, and others. Among the topics that we tackle in FMC: flight dynamics, dynamic systems, theoretical control, theoretical analysis and algorithms for control of dynamic systems, optimization and robustness in aircraft and airline operations, air traffic management, the environmental impact of aviation, decision support system design, human factors in aviation, computational cognitive modeling for engineering design, dynamical system theory, information and complexity theory; linear and nonlinear robust multivariable control for aerospace systems, stability theory for nonlinear dynamical systems, fault tolerant estimation and control theory, digital avionics system design and integration, neural network adaptive flight control, vision-based guidance/navigation/control, autonomous aggressive maneuvering, and machine learning. Flight vehicles of the future will be increasingly autonomous and robotic, performing missions right out of science fiction books. Future spacecraft will fly to the other planets, automatically land, and subsequently construct buildings for future human habitation. Future aircraft will automatically plan a route through a complex urban area with many different aircraft operating in the space, automatically take-off, fly the mission, and land while dynamically adjusting the route as obstacles appear during flight. To make this type of mission a reality requires the depth and breadth of research being performed in the FMC group. The FMC program is making break through advances in the dynamics and automatic control of flight vehicles. Faculty in the FMC group are established leaders developing useful theories and algorithms, performing enlightening experimental demonstrations, and creating innovative new technologies and components. The FMC group operates several centers and laboratories to conduct its research program. The Center for Advanced Machine Mobility (CAMM) is a multidisciplinary research center consisting of a network of faculty and students engaged in creating new mobile platform technologies and configurations. A focus of the CAMM is creating highly specialized and application specific technologies to improve the mobility of new and existing platforms. This often takes the form of integration of emerging technologies into platforms in innovative ways to create enabling features and capabilities for mobile machines. The CAMM operates numerous unmanned aircraft, rotorcraft, and guided airdrop systems to perform its research. The CAMM also operates the Indoor Flight Facility (IFF), a state-of-the-art motion capture laboratory. The cornerstone of the IFF is a VICON Motion Systems motion capture system in combination with a control computer using the motion capture system software. The motion capture system act as a “sensor” and is used to measure points on the vehicle and landing zone in real time. The position of points of interest is tracked using a 3-D optical position analysis system from VICON Motion Systems. Small reflective markers, 3 millimeter in diameter are placed on different points of interest. Twelve cameras strategically placed throughout the laboratory emit and collect visible red light reflected from the markers. Data from all twelve cameras is collected and used to determine 3 dimensional position of all visible markers. Each camera has 1.2 Mega-pixel resolution and is capable of capturing marker position at a rate of 1000 Hz within 1 millimeter accuracy. 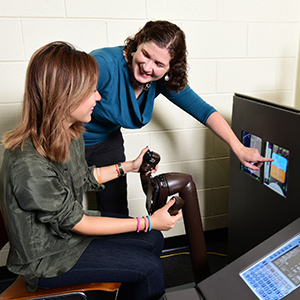 In addition to establishing mobile machine technologies, the CAMM is also focused on educating the next generation of mobile machine engineers and researchers. Rigorous coursework in dynamics of physical systems, control system engineering, mechanical/aerospace system design, and mechatronics combined with experience in conceiving, planning, executing, and reporting advanced research seeks to synergistically develop students into highly capable professionals that are work ready. AE faculty in the FMC group are having a significant impact in industry, government, the military, and beyond. Find out more about their research and their vision for the future. Get the full picture by finding out about all of the AE labs, collaborative groups, and centers. Download the FMC fact sheet (PDF).